Vegetarian quiche recipe! Ready in 30 minutes! I had 1 pie crust/dough and a ton of eggs to use, so I decided to whip up a quick quiche! We didn’t have a whole lot to work with in the fridge, but I rounded up some shredded sharp cheddar cheese, about 10 jalapeno slices, ½ a green pepper and a few tbsp. diced white onion. Some of my best recipes are made this way/using what I’ve got left over in the fridge! Whisk the eggs, milk, peppers, jalapenos, cheese, flour, and onion. Arrange the pie crust dough in pie tin. Bake for 25-30 minutes/until egg is set. 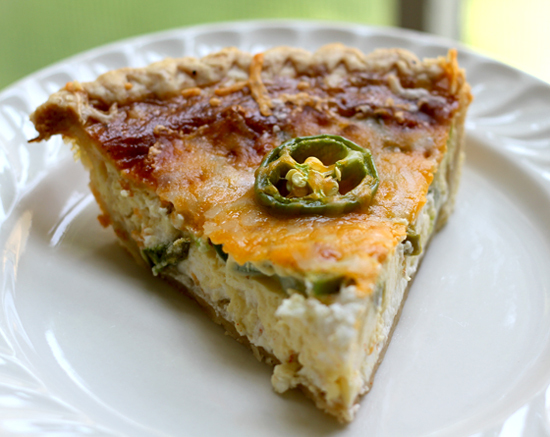 About half way through the baking process, I sprinkled a bit more cheese on top of the quiche and added a few jalapeno slices for an added touch. Optional!